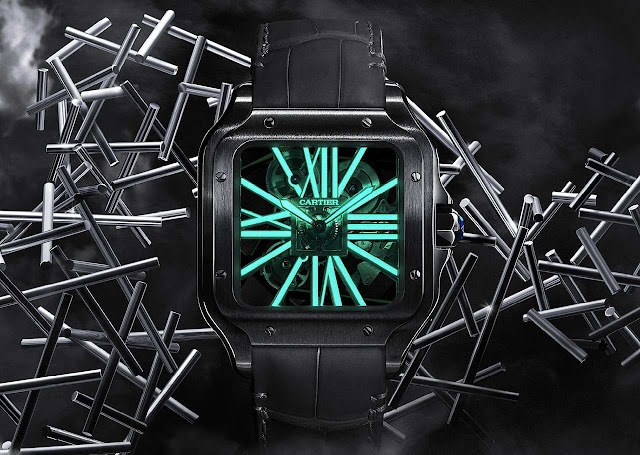 Introduced last year at SIHH 2018, the redesigned Santos de Cartier line keeps expanding with new models. 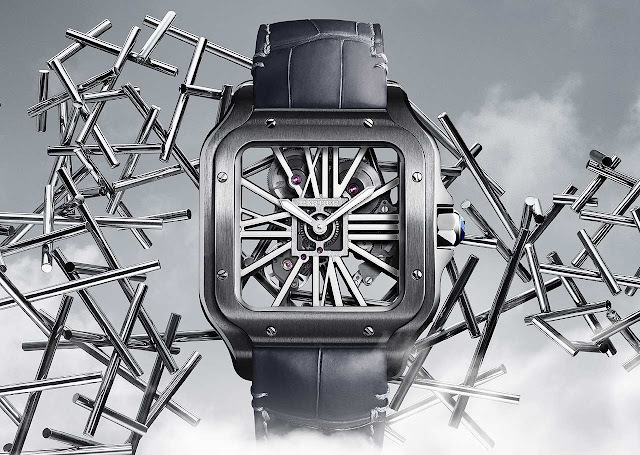 Among the novelties presented at the Salon International de la Haute Horlogerie 2019 last January, the Santos de Cartier Skeleton Noctambule watch comes in a Large (39.8 mm x 47.5 mm) case crafted from stainless steel with an ADLC (Amorphous Diamond-Like Carbon) treatment for a casual and modern look. The bridges in the shape of Roman numerals of the skeletonized movement are generously coated with Super-LumiNova pigments which, while invisible during the daytime, reproduce and radiate the stored light once night falls. 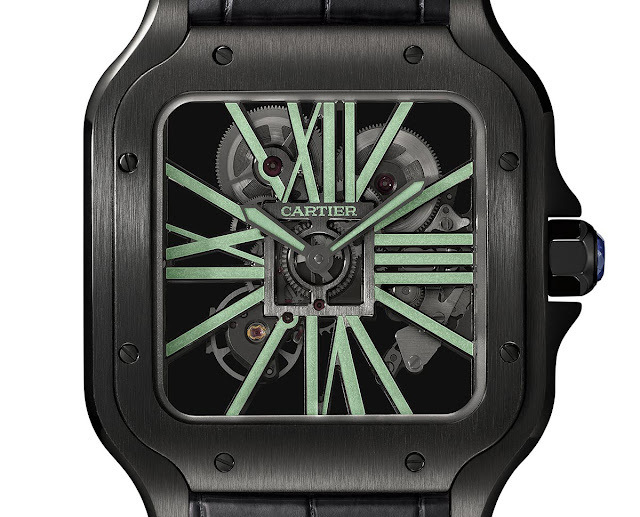 The bezel smoothly integrates with the lines of the case and the alligator leather strap which can be easily changed thanks to the patented Cartier QuickSwitch system. The hand-wound movement, Calibre 9612 MC, beats at a frequency of 28,800 vibrations per hour offering a power reserve of 72 hours. Santos de Cartier Skeleton Noctambule WHSA0009. Among the novelties presented at the Salon International de la Haute Horlogerie 2019 last January, the Santos de Cartier Skeleton Noctambule watch comes in a Large case crafted from stainless steel ADLC. 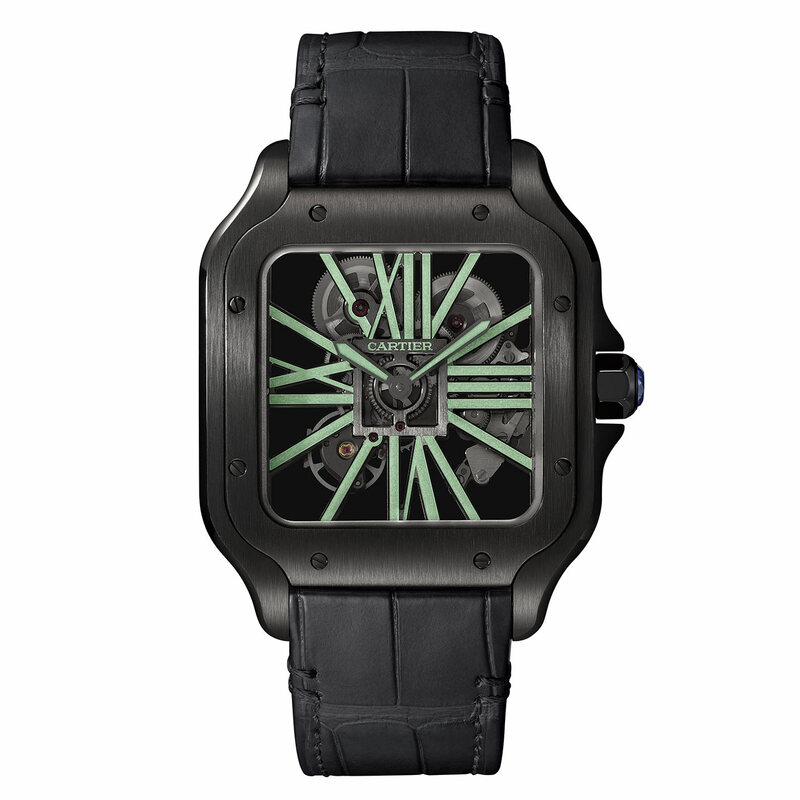 The price of the Santos de Cartier Skeleton Noctambule WHSA0009 is Swiss Francs 26,500.